Prime Minister Julia Gillard with Say Htoo Eh Moero. 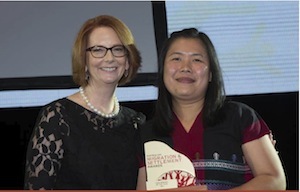 Say Htoo Eh Moero from Wyndham Community and Education Centre (WCEC) has been named Case Worker of the Year at the inaugural Migration and Settlement Awards in Canberra on March 18. The award, presented by Prime Minister Julia Gillard, recognises Say Htoo’s outstanding commitment to the settlement of newly arrived refugees and migrants. Say Htoo’s dedication as a settlement case worker stems from her own experience as a Karen refugee. She was 16 when she arrived in Australia from Burma in 1994, and, she says, services were limited and finding help was hard. Although Say Htoo had a sister already here, it was still a ‘struggle’. She understands and empathises with people who have recently arrived — whether they are from camps on the Thai–Burma border or in Sudan — and she is committed to helping them settle and live independently in Australia. Say Htoo’s job ranges from providing practical assistance to emotional support. In an average day she could be helping people pay bills, find housing or deal with the loneliness of life in a new country, often far from family members and friends. It’s challenging work. By the time they arrive in Wyndham many refugees and humanitarian entrants are suffering from physical and mental health problems that are a result of life in the camps. They also suffer from the stress of the language barrier and the difficulty of adjusting to a new life. 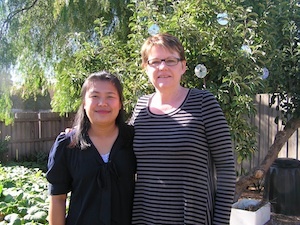 Say Htoo Eh Moero and her manager Kathy Brunton in WCEC’s vegetable garden. But Say Htoo is well-known for her modesty so it’s her manager Kathy Brunton who explains why she nominated Say Htoo for the award. Say Htoo is in high demand both inside and outside of WCEC’s office hours, Kathy says. She and her family have an ‘open door’ policy at home. 3ZZZ radio station work out of the family’s garage, people are encouraged to drop by to help themselves to the vegie garden and it’s not uncommon for her to be approached for help when she’s at church or out and about in the community. Settlement assistance is just one of a range of services offered at WCEC, a vibrant and busy centre in Melbourne’s western suburbs that was also nominated as a finalist in the Settlement Innovation category of the awards. WCEC has been creative in developing support for new refugees and migrants and it auspices and leads the Wyndham Humanitarian Network. The centre offers community classes such as sewing and weaving, Broadband for Seniors, VET, VCAL and language and literacy training courses. The centre’s services and programs aim to encourage and support people to become active participants and contributors in their local community.